buildings of any kind; will include castle hotels, B&Bs, hostels and self-catering in the UK, abroad in Europe and Worldwide. A beautifully furnished, self-catering apartment on two floors of Dollarbeg Castle. Originally built in the C19th, the property combines traditional Scottish baronial architecture with modern decor and comfort. It is set within five acres of communal gardens. The apartment spacious living area was formerly the ballroom. An exceptional, award-winning fortified manor that dates back to the 1400's. It comes with a wealth of features such as four poster beds, oak panelling and beams, Juliette balconies and spiral stone staircases – as well as all modern conveniences. Great for groups and family gatherings, it sleeps up to 24 guests. 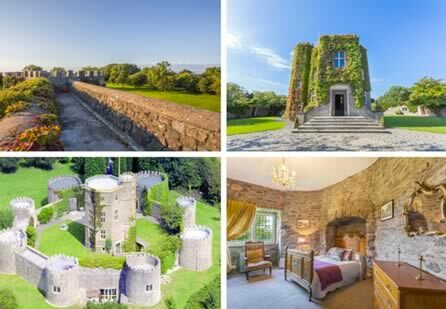 Grade II listed Bodelwyddan Castle is now run as a hotel, offering a range of comfortable stylish rooms, lovely grounds and heaps of activities and entertainment. The castle is also home to a gallery of art treasures from the National Portrait Gallery 19th Century collection. Nearby are attractions like Conwy Castle, Trefriw Woollen Mill, Caernarfon Castle, Snowdonia National Park and the Welsh Mountain Zoo. United Kingdom Castles Collection: a selection of UK castle, mansion and country house accommodation across the UK from Scotland to Cornwall. Properties of all sizes from cosy 2-bedroom properties up to 14-bedroom castles for groups. A historic castle building, dating from 1420, and now converted to comfortable, family home-style, self-catering holiday accommodation for up to 14 guests. It's set right in the Irish countryside, yet is just a 45 minute drive from the capital, Dublin, offering the best of both worlds. A Tudor mansion with beautiful landscaped gardens and a famous Orpheus mosaic floor. The hotel offers a broad range of activities, indoor and outdoor; comfortable inclusive rooms, some with with four posters and spa baths; and a tempting range of special breaks and activities, such as a helicopter experience, racing at Newbury, clay pigeon shooting and murder mystery breaks. Oliver's Travels offers a huge range of unique and very different holiday properties in the UK and throughout Europe, including many grand buildings, mansions, castles and châteaux for holiday rental. Tawstock Castle is a historic Grade II listed Bailey castle some of which dates back to the C18th. It has now been converted to luxury self-catering holiday accommodation sleeping up to eight guests in four bedrooms (including tower bedrooms) and including a private castellated roof terrace, lawned gardens and parkland. Hotel accommodation in a grand Victorian mansion; the building is lush, ornate and magnificently restored, with fabulous landscaped gardens designed by Sir Humphrey Repton, plus a secret Victorian rose garden – a fabulous place to stay! The hotel offers a range of room grades, a choice of three restaurants, use of sports and leisure facilities, including the spa, and live entertainment. Live the fairy tale in this stunning converted C17th Castle! As all castles should, it sits at the top of a hill and enjoys glorious 360° views of the North Somerset countryside and the Bristol Channel. This fantastic venue has eight en-suite bedrooms and can sleep up to sixteen guests. The main part of the accommodation is on four levels within an octagonal keep. Around this are eight separate turrets which house bedrooms, function/party rooms and utility areas. One of these turrets is also an entertainment area with pool table, table football, darts, lawn games and TV; as well as a living room, kitchen, bathroom and double bedroom. The castle has its own indoor pool, a beautiful wooden hot tub with wood burner, a large kitchen, a grand sitting room with large stone fireplace, library and reading room, and patio areas. Altogether a stunning location for group get-togethers, special occasions, family gatherings and holidays. A cosy two-bedroom castle apartment in the Baronial-style Dollarbeg Castle in Central Scotland, in a location near to Gleneagles, Perth, Stirling and Edinburgh. The castle is set in countryside setting and within beautifully landscaped grounds. This is a modern apartment in a old setting, it's well fitted out with luxurious furnishings and fittings. The main living area is open plan, and it has one master-bedroom, as well as a second small twin; it can sleep up to four guests. Do you want to live like royalty? Fancy being Lord or Lady of the Manor for a few days? Are you looking for a romantic setting for a special celebration, or somewhere really special for a group gathering? This section lists holiday accommodation in castles, grand buildings, palaces, old manor houses, châteaux, stately homes and fine country houses – usually large buildings, with or without fortifications, that were formerly the home of the nobility, royalty or wealthy land owners. This sort of property has often been converted into some sort of holiday accommodation, perhaps a hotel in a former stately home or self-catering accommodation in a small castle. The self-catering properties make great venues for large group or family gatherings or to celebrate a special occasions. Smaller groups, families and couples are catered for too, look for properties that have been split; perhaps manor house apartments, the wing of a country house, or the tower or turret of a castle. If you're attracted by the idea of a holiday castle then also take a look at our towers section, or take a look as our follys list. 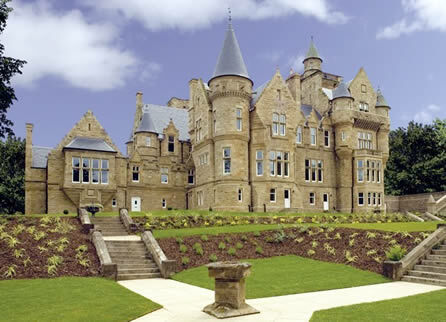 The travel-quest castles and grand buildings accommodation section is for listing castles, manor houses and grand buildings of all kinds converted to holiday homes or used as bed and breakfast accommodation or within hotels and guest houses. See the definition at further up the page for more details. Within each category the Travel-Quest Blue Directory includes a checked and edited listing of specialist holiday accommodation providers, sometimes with offers and deals for our readers, many of which are exclusive to this site. If you wish to add a listing to the accommodation providers directory use the Submit Site link in our site navigation. Unless credited otherwise, any photos used on this page are copyright of the Travel-Quest Directory or of the companies listed. See our Photography Policy for more details (including any credits for photo collages). Any other specific credits for this page now follow. Links to any Licenses are on our Photography Policy page.